The Royal Albert Victorian memorial museum and art gallery. Opening times: Open Tuesday to Sunday, 10:00am to 5:00pm. Museum is closed Mondays and bank holidays. Age: Everyone! 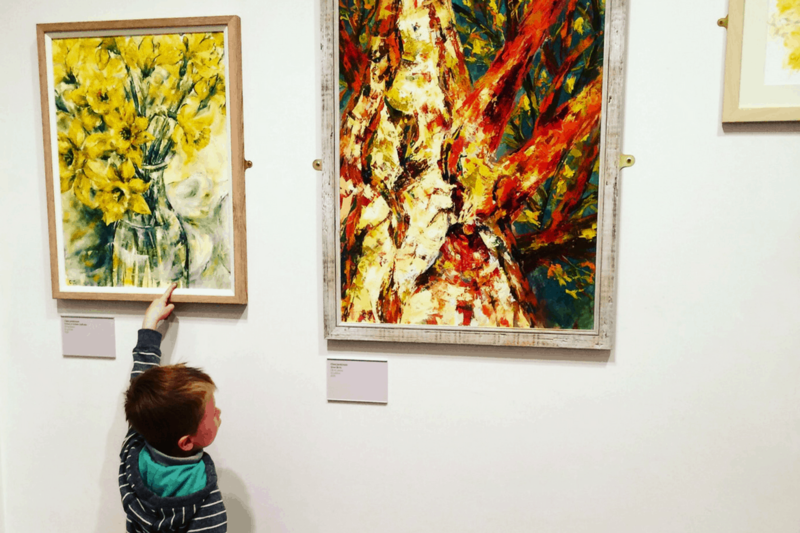 Toddlers can run about and stare at all the visual wonders whilst older children can get involved with the different exhibitions. Price: FREE (It also has free Wifi). RAMM is probably one of my favourite rainy day places to visit in Exeter. You can pop in for half an hour’s distraction or spend most of the day dawdling down the corridors. When I first took my son I was anxious about sticky fingers on glass, breaking something thousands of years old and frowning ‘shushers’ as he howled through the corridors. Instead I found a family friendly building full of little feet. The building itself is beautiful. Located right in the city centre, a stone’s throw from central station or the nearest parking is Guildhall or Harlequins Shopping Centre. There are two entrances; one on Queens Street, up a few steps, where the volunteers and staff are outstandingly welcoming and will explain where everything is and what you may like to see. Reception is at the garden entrance alongside Rougemont gardens. It is easy to navigate but make use of the free floorplans available otherwise you may miss things if you are not familiar with the layout. Bee bags are available for young children. They contain a selection of toys and ideas for exploring and are free to use. Explorer bags are also free for adventurous 7-14 year-olds. If you like a challenge quizzes are free to download on the RAMM website or you can buy them when you visit. Little things like this make a parent’s life so much easier. RAMM promotes family learning and offers a range of school holiday activities. The museum has eclectic world-class collections and exhibitions that are varied and well organised. There is also a small art gallery. Everything is well labelled and identifiable. Case histories is where the well-loved local Giraffe Gerald resides with a few large animal friends. The other night having dinner my son randomly piped up ‘George V shot a tiger and it’s in the museum.’ The world culture galleries are fascinating learning for older children and my son loves the Egyptian mummy tomb, though he has to whisper because he is afraid of it waking up. There are dinosaur bones, an extensive geology display with fossils in the area., birds and a LOT of bugs where you can use magnifying glasses to see them up close (mummy does not enjoy this!). Many of the exhibits are interactive, like the Devon Longhouse with its little wooden animals, replica Greek and Roman soldiers’ helmets for dressing up, a wooden playable xylophone and electronic games. My favourite thing in the cabinet of curiosities by the courtyard, is a stack of glass jars with people’s favourite smells, like freshly cut grass. An accessible building there are toilets on each level and baby changing facilities that I have always found clean. There are sports type lockers where you can secure bags full of Lego whilst you use the café and explore the museum. The lift is large and there is wheelchair access at front and rear, with two bookable disabled parking spaces at the back if the building. Also, when the weather is good the garden is perfect for picnics and cartwheels between exploring. The Pantry Café is open Tue to Sat: 10am to 4.30pm and on Sun: 10:30am to 4:30pm. It serves a selection of homemade food and a really good cup of coffee for waning parents. I always find it clean with a fair choice of food and snacks (with gluten free options). Jugs of tap water freely available. Prices are reasonable and the staff are friendly. It can get busy, and loud at weekends and holidays. I would highly recommend a visit for all the family Lots to see, lots to try out and lots to try on. Have you got a favourite place you have visited in Devon?